Adult coloring books are all the rage these days. The intricate patterns that fill them take a long time to color in and many people use them as a form of relaxation and mediation. 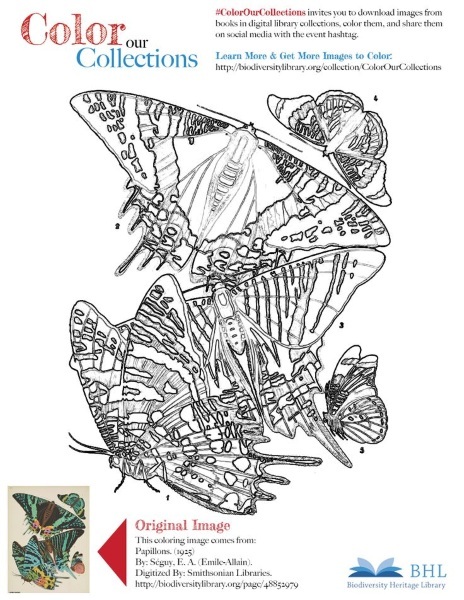 If you’re tired of mandalas and geometric designs then the Biodiversity Heritage Library has a got a treat for you! They want you to color their collection. In the time before photography, budding naturalists had to draw everything they saw and wanted to record. The BHL has scanned these in black and white (and sometimes a sort of yellowish) and put them up for anyone to download and color to their heart’s content. The images include close ups of plants, animals, insects, and even some animal anatomy. Each drawing doesn’t fill a page but they are all fairly intricate and detailed calling for the same level of care that all of those geometric designs do. The pages are free on Flickr and Pinterest. They even have a coloring book ready to go through Google Docs. Mosey on over to the website to check out these free pages.